NES Castlevania III: Dracula's Curse (JPN) "Alucard path" in 24:47.73 by zggzdydp. 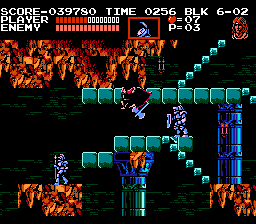 Castlevania III: Dracula's Curse (originally known as 悪魔城伝説 or Akumajō Densetsu, meaning "Legend of the Demon Castle") is the story of Trevor Belmont's battle against Dracula from the times before Simon's battle in Castlevania. In this complex and difficult game, there are three playable allies whom Trevor can recruit: Alucard (Dracula's son), Grant DaNasty (a pirate captain), and Sypha Belnades (a mystic warlord). This game has a technically high-quality soundtrack because it uses a VRC6 sound chip that works in the Japanese Famicom but not in the NES. Thus, the movie was made with the Japanese version of the game instead of the USA version. This movie takes the path that recruits Alucard. It improves the predecessor movie by 27.50 seconds. There's also a Grant path movie and a Sypha path movie.